We just got back from a great family vacation in southwest Utah. While we did a bunch of activities like hiking in lava tubes, climbing on petrified sand dunes, zig zagging up cliffs at Zion National park, and lots of golf, we hardly saw any trains. Except for about 30 minutes of railfanning North Las Vegas on the day we arrived, and two intermodals we saw on the way back to the airport, we didn't see a train for the whole week. Just before we left, Tim Harrison interviewed me for the ModelRailcast podcast. We talked about my various projects, layouts and books. The audio track is available on itunes and at this link for non-itune users. This is an overall view of the diorama. The Virginia Locomotive and Car Works is on the far left. 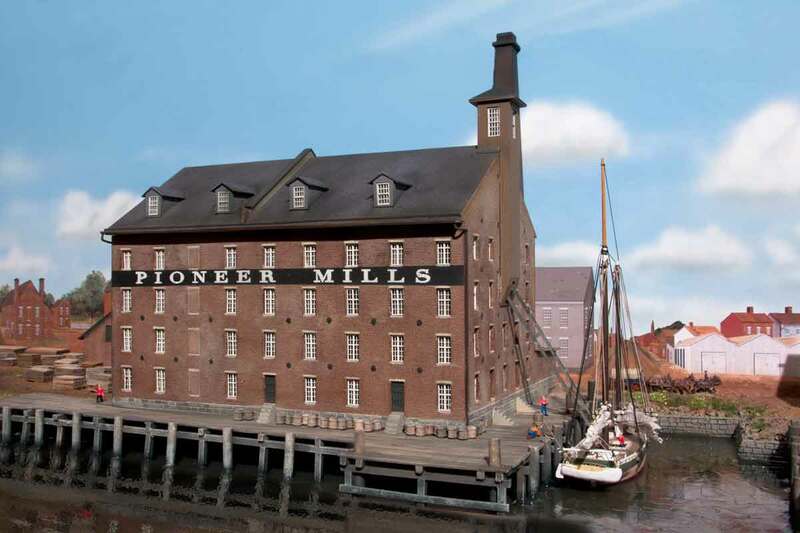 A coal wharf with canal boat is in the center, and the Pioneer Mills flour mill and grain elevator is on the right. I used Photoshop to extend extreme sections of the backdrop to cover the full width of the diorama in this low angle view. Seeing this view makes me want to try it again in O scale. The past week was a busy time highlighted by my 60th birthday. It started off with a evening visit to The National Gallery of Art. It's always fun to take time to visit the museums on Washington, DC mall. The galleries in the East Building were mostly closed, though the atrium was open. I did note a trio of onlookers discussing Smith's "Die." The "Die' is a 6-ft steel cube that the artist subcontracted to a local shop for fabrication. Once assembled, its rusty surface was hand rubbed with oil. I feigned interest in the piece to listen to what the admirers said. I was rewarded with a stream of modern art babble worthy of Beetlejuice's Otho. I could only take so much of that, so I wandered over to the west building. There I came across, and was especially impressed by, this bust of a veiled nun. The sculptor (I believe it was Guiseppe Croff) captured the gossamer veil in stone. Amazing. But it wasn't rubbed in oil. I always enjoy seeing the impressionists, but this time I seemed to gravitate to the 19th century landscapes. There even was a nice train painting, George Innes, "The Lackawanna Valley." I took another look at Winslow Homer's work. He is one of my favorite artists. On Wednesday, I took a road trip with my mom to celebrate my birthday. We went to the Delmarva peninsula to see the Chesapeake Bay Maritime Museum, St Michaels, MD. Special thanks to the museum staff, especially Paula, for the guided tour of the museum. St Michaels is a charming town. I used to enjoy riding my bike there, but had not visited in nearly 20 years. Then we stopped at the Delmarva Model Railroad Club to see their layout. While in Delmar, DE I spotted a NS engine idling.Later that evening I presented a talk to the club members and wives on the railroads of the civil war. They seemed to enjoy the talk and we had fun meeting the members and seeing their layout.Special thanks to John Huntzinger for inviting me. On the weekend I finished up the Alexandria Waterfront diorama in between two rounds of golf and 5 birdies. I started taking the final photographs of the diorama before I deliver it later next week. On Saturday, Scott Wahl stopped by to examine some of my steel mill models. 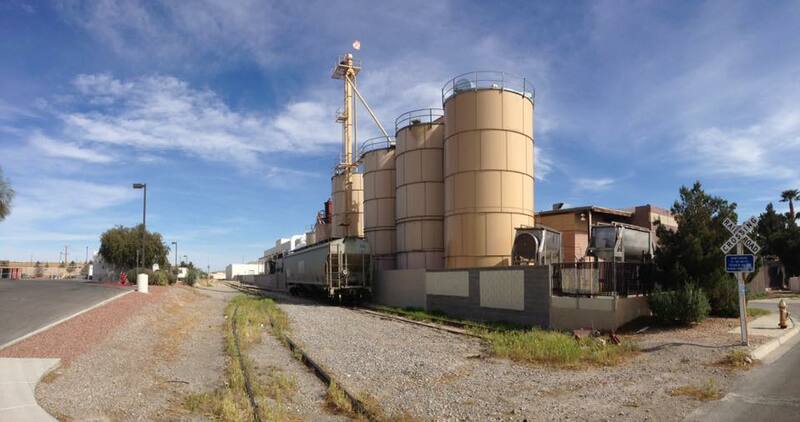 Scott is a member of NV NTRAK. He is working on a home layout based partly on modules. Scott ended up buying the N scale blast furnace, coke works and some steel mill cars from me. I was very pleased to find an enthusiastic modeler that will put these models to good use. I am looking forward to seeing what he comes up with in his layout. On Sunday, Nancy Griswold, one AW's friends from law school, toured the layout with my mom. Nancy made a home made sourdough bread and mom made a pear tart to wrap up the birthday celebration. I was interested in seeing Nancy's reaction to the layout as she is an accomplished artist. She had some good comments, especially with regard to the detail on the layout.